If you're feeling stumped about what to get Mom on her big day, we feel you — moms are a picky bunch (but we love them for it). So, we've put our thinking caps on to come up with some gift recommendations worth writing home about. Below, 10 Hunker-approved gift ideas for Mother's Day. Here's a fact: Most moms love coffee. 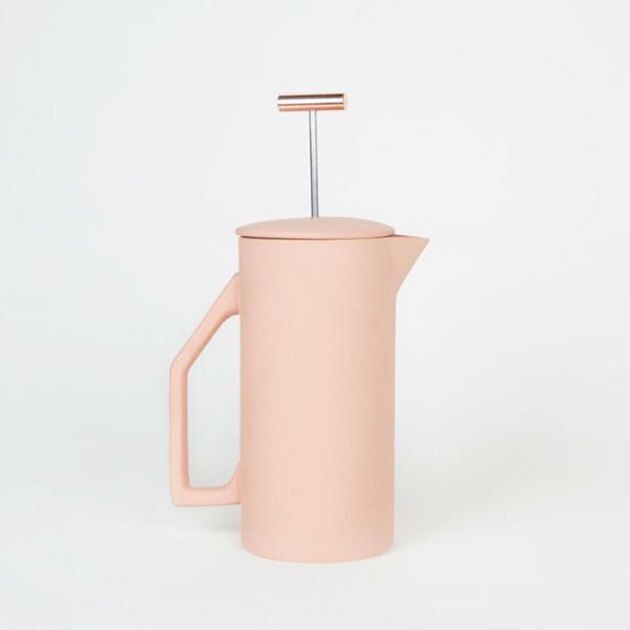 This gorgeous French press is the upgrade she deserves, plus it looks awesome perched on any countertop. Speaking of coffee, it's the classy thing to have a dedicated coffee scoop. And this one even clips your coffee bag closed. Handy! Beautiful art for your mom's home can never hurt. This wall hanging is assembled by Austin-based designer Corie Humble, but each piece of bronze is cut by master artisans in Santiago, Chile. A gift with a story. You can't go wrong with this simple, delicate, 14-carat gold-dipped necklace with an inspirational message. And don't worry: It comes in a gift box. Here's the low-down: This gel nail polish is awesome because it doesn't damage your nails the way a nail salon gel manicure does. While it doesn't last quite as long as its nail salon alternative, it definitely lasts longer than regular polish. Worth it. For lighting her favorite candles. Just strike a match against the stoneware base of this handmade beauty. And speaking of candles, most moms would never treat themselves to a splurge-y one. That's why you have to do it for her! Jewelry designer Kendra Scott's signature candle not only is a total showpiece, but also smells delightfully of lily and blonde woods. Don't forget a card! You can include it with your present, or fill it with a gift card. This adorable one is by Mr. Boddington's Studio — a Brooklyn-based stationary brand. Why this particular shower gel? Its scent is unintentionally reminiscent of Chanel's Coco Mademoiselle, for a fraction of the cost. Seriously. Give it a sniff to see if you agree. If you're looking to splurge, do so on something she'll use almost daily. In this case, we're talking about Dyson's game-changing hair dryer. It's ultra-light, so her arm won't tire out, and dries hair super quickly.